Frozen Hot Chocolate- Combining the perfect blend of rich Ghirardelli cocoa, cream, and marshmallow, this flavor takes winter’s favorite hot drink and perfects it in frozen form. Dark Chocolate Blueberry Sorbet- Inspired by Ghirardelli’s Dark Chocolate Blueberry square, this sorbet provides delicious dark chocolate flavor from Ghirardelli cocoa, followed by notes of sweet blueberry. Yogurtland guests can pick up their ‘I Heart Ghirardelli’ cup and swirl up their choice between two flavors Made With Ghirardelli or both, and head over to the topping bar to build their satisfying, delicious creation with even more Ghirardelli goodness with Ghirardelli toppings and sauces. 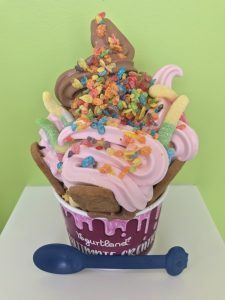 With over 60 fruit, candy, cereal, nuts, cookies and other toppings to choose from, Yogurtland offers fans the chance to completely customize their ultimate creation experience with all their favorite additions. 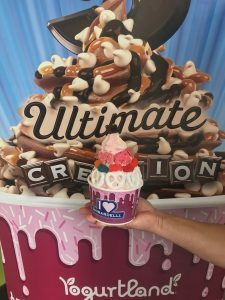 All of Yogurtland’s flavors meet the National Yogurt Association Criteria for “live and active culture frozen yogurt” and are produced in a kosher-certified facility. Yogurtland features non-fat and low-fat yogurt flavors as well as non-dairy and no sugar added choices while using milk that does not contain antibiotics or added hormones. Fruit flavors are fortified with Vitamin C for an extra boost. Credit: Yogurtland. Photos and information were provided. Some form of compensation may be received for posting.